Tucker Carlson officially took over Bill O’Reilly‘s 8 p.m. ET Fox News’ time slot on Monday night, and began his program with a message to viewers who made “The O’Reilly Factor” the most-watched show in cable news for nearly two decades. Carlson moved from 9 p.m. ET to 8 p.m. ET to replace O’Reilly, who was fired from Fox News Channel amid allegations of sexual harassment. “The Five” moved to 9 p.m. and a new show featuring Fox News host Eric Bolling will launch at 5 p.m. ET next week. 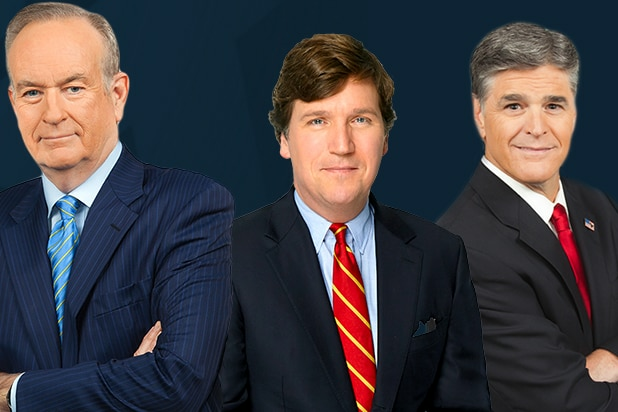 “Tucker Carlson Tonight” has moved three times since launching less than a year ago as a replacement for Greta Van Susteren and then moving to primetime to replace Megyn Kelly. The show has been extremely successful and Fox News execs hope it can stick at 8 p.m. ET and Carlson can emerge as the new face of the network. Earlier Monday O’Reilly released a podcast with his first public comments since Fox News’ decision to part ways. O’Reilly was let go last week following a New York Times report that he and the network had paid out $13 million to five women who accused him of harassment or misconduct.